Eon Alternative decking, railing is 100% plastic made from a highly engineered polymer. Eon will not fade, splinter, warp or crack and is virtually maintenance free. No sanding, staining or painting required. Eon Decking is backed by a 25 Year Warranty. No need to shop anywhere else, Eon offers a complete solution for your outdoor project from start to finish. EON Ultra premium resin decking and railings are made from 100% engineered polymer. Created with natural colour variance, along with wood grain texture, inspired by the appreciation of beautiful true wood products. EON Ultra does not contain wood fibres or any other organic material, making it resistant to water, mold, mildew, rot and insects. EON Ultra will not splinter, warp or crack, and is virtually maintenance free. No sanding, staining or painting required. No need to shop anywhere else, EON offers a complete decking solution for your project from start to finish. The RailBlazers. Aluminum Railing system is designed with an emphasis on style, durability, and quality. Our patented railing system is engineered to be safe, DIY-friendly and easy to install. Made from powder-coated aluminum for low maintenance and lasting performance. Customize with standard or wide aluminum pickets, glass panels, decorative spacers, and more! Available in black and white. Get beautiful, PRO quality results for any deck, patio, or balcony.The 4 ft. Hand and Base Rails connect to the railing posts to create the framework of your railing system. They can be cut to shorter lengths. Step-by-step installation guides, videos and other resources are available to guide you through your installation. 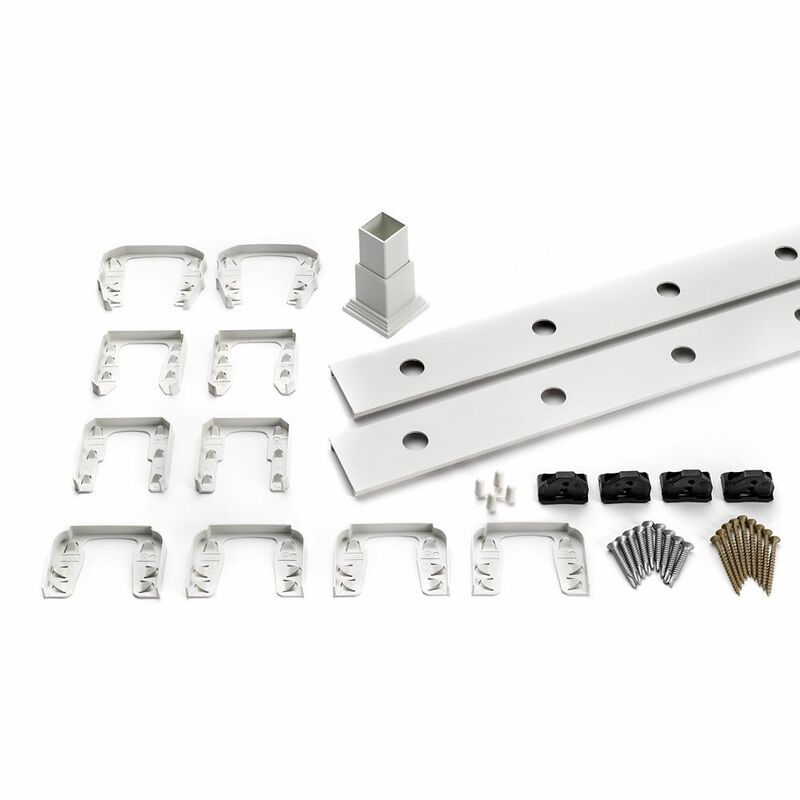 For use with: End/Mid/Corner/Stair Post, Decorative Spacers, Standard Picket and Spacer Kit, Wide Picket and Spacer Kit, Standard Stair Picket and Spacer Kit, Wide Stair Picket and Spacer Kit, Glass Panels, Glass Panel Gasket, Universal Connector, and Wall Bracket. 6 Ft. - Infill Rail Kit for Round Aluminum Balusters - Horizontal - White When people look at your deck, they'll see railing before anything else. Which is why a picture-perfect deck means selecting railing that signifies your style. With Trex, you can mix and match railing components to create a unique look, or choose from our Decking & Railing Duos for a simplified design approach. Trex Transcend Railing is as strong and sturdy as its namesake decking, putting every railing possibility within reach.